In 1908, the public school trustees of St. Catharines decided to replace the George Street school, on the corner of Edmund street in St. Patrick's Ward, with a new school, in order to help alleviate the crowded conditions in St. Catharines schools. Early in 1909, land for the new St. Patrick's Ward School was purchased from William Prout for $2500. It is interesting to note that Mr. Malcolmson, the board member responsible for selecting the new site, received some opposition for choosing a location so far out in the country. An adjacent lot was purchased from Gertrude and Henry O'Loughlin in November 1910 for $250. The original site was enlarged in 1913 by the purchase of another adjacent area from John and Sarah Riley for $2300. On February 14, 1910, the eight room Alexandra Public School opened with 303 pupils. The first principal, or Head Mistress as she was then called, was Miss Millicent Holmes. During the years that followed, the enrolment increased from 303 to 465. In 1913, the Public School Board authorized the original architect, Thomas H. Wiley, to prepare plans for a four room addition to be built without delay. Newman Brothers were successful tenders for the general contract for $12000. This addition was ready for occupancy by September 1, 1914. As this area of the city grew, the enrolment at Alexandra further increased. By September 1916, it had reached 610. A further addition of four rooms was needed, and the Board again approved Newman Brothers as general contractors. The new rooms were built for $21750 and were occupied by September 1, 1917. Alexandra became the largest city public school, which it remained for many years. On the night of Thursday, January 30th, 1958, a fire of incendiary origin partially destroyed Alexandra school. Temporary arrangements for the housing of pupils were soon made. As soon as possible, classes were returned to classrooms not destroyed by fire. The class that was put in the library was the only room with hydro from January to June. The Board decided to competely renovate and remodel the old building. 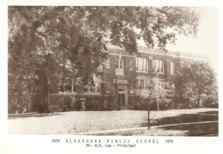 On September 1, 1958, at a cost of $102130, the newly renovated Alexandra School opened with an enrolment of 507 pupils with 15 teachers and a principal. The school carried on in this fashion for many years, until the Board working in cooperation with a group of concerned parents and the city of St. Catharines, decided to build a general purpose room to serve as an auditorium and a gymnasium for the school and the community. The city's generous grant of $25000 enabled the Board to apply for and receive a Community Centre Grant of $75000 from the Province to which the Board added from their own finances. The tender was awarded to Thorold Construction Company and the dream became a reality. In 1998, Alexandra underwent another extensive renovation.